In October 1973 the Yom Kippur war erupted in the Middle East and soon Arab nations massively increased oil prices, which were approximately quadrupled (many revolutionaries put this oil price hike down to a direct and conscious attack on the autonomous working class movements in Europe, a way of deliberately using and intensifying a crisis as a way of reinforcing the market and its authority). Inflation rose, real wages fell and trouble was again brewing in the coalfields. National Union of Mineworkers (NUM) leader Mick McGahey spoke of "defeating the government", though he stressed he meant by parliamentary means. "Phase 3" – the statutory regulation of wage increases to 7% - was brought in by the Heath government, though this government left itself the loophole of allowing extra in the case of workers working unsocial hours. The NUM executive officially "rejected" the wage offer, although Gormley was anxious to avoid a strike because "there might be an election and the Tories might win it." (he was later proved wrong – the government's part in crisis management was later taken over by the Labour Party under Wilson, and then Callaghan). An overtime ban was declared by the union on Nov.12th '73 and the Heath government declared a state of emergency the next day!!! Clearly the government created the crisis in order to mobilise the country and other sections of the working class against the miners. A national co-ordinating centre was established by the police. The TUC, the Government and the NUM tried to avoid an immediate strike: the TUC promised that if the miners got more than 7% the TUC would oppose any strike by other workers for more than this figure – the TUC would abide by Phase 3. In Jan. '74, as coal stocks dwindled, a 3-day week was declared for industry, the temperature of heating was limited, there were more power cuts and - horror shock! - television broadcasting stopped at 10.30 p.m. More than a million industrial workers were temporarily laid off. A general election was called 2 days after a union ballot went in favour of a strike, with Heath posing the simple question to the voters – "Who governs the country?" . Heath had hoped the electorate would say he did, but in fact neither the Labour Party nor the Tories got a clear mandate, though Labour got more MPs than the Tories. The miners strike had little of the autonomous aspects of the '72 strike (though there was an independent form of solidarity with the strike which became very common: in response to the government "SOS" campaign to "Switch Off Something" thousands of stickers were produced with "Switch On Something" and millions supported the miners by burning too much electricity).The NUM executive, with Scargill now part of it, co-ordinated picketting nationally; pickets were limited to 6 people. 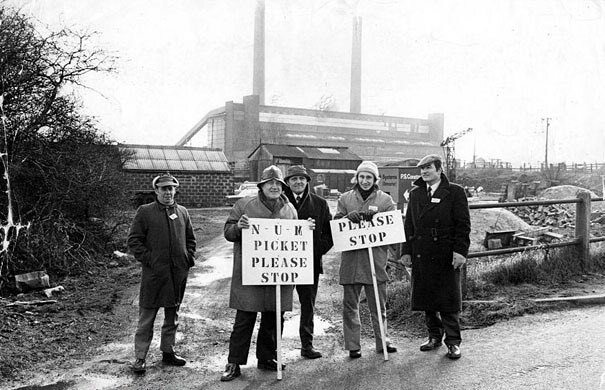 After Labour won the election, the NCB increased its offer under pressure from the government, and the NUM called off the strike, though Scargill wanted to continue it. One man who had been invalided out showed me his hands. They were red and torn. Parts of fingers were missing and bones had been broken which had not healed anything like a normal hand. The man was on social security, having had to give up work because of a chest condition. His hands, apparently, were not considered as being a good reason for not being able to work. He told me his story was by no means unusual. The interesting thing was that this miner was receiving payments which were not much less than the take-home pay of those of his mates now working a basic five-shifts week. Everyone was eager to stress that they were doing a full week’s work without overtime. They denied they were ‘holding the country to ransom’. They felt very bitter about the way the Government and the media were presenting the position. A young man, employed at a local light engineering firm, presented a sharp contrast to the miners’ position. He was working 3 days and drawing 5 days’ unemployment pay; gross pay £31 per week, take-home pay £29. When he worked a full week he grossed £37, and took home £31. He said ‘I don’t mind working a three-day week for only £2 less than full pay’. I wondered how widespread this was, although I don’t want to imply that there is no suffering as a result of the imposition of the three-day week. 1 felt the bitterness of some miners, living alongside men who were so much better off. They also felt bitter about the profiteering encouraged by the Government, while they were expected to work massive overtime in order to satisfy their modest needs. Everyone said ‘we are not on strike - we are working a normal basic week, for basic rates, which is not enough to live on’. When I asked how they felt about the need for more coal, the reply came from almost all present, in chorus. ‘If they want coal, let them come and. get it. We won’t stop them’. When I asked who they meant by ‘they’, I was told ‘all those who say the nation can’t pay the miners more’. We talked about the possibility of a general election if the miners didn’t return to ‘normal’ (i.e.. overtime) working. Attitudes were mixed, and in my view very confused. Some said ‘It would make no difference who formed a government, they would still have to settle the question of the miners’ pay’. Others thought they would be better off under a Labour Government. Some had faith in their trade union leaders. Others were suspicious of them. One man said ‘They can’t settle on the basis of some productivity deal. We cannot work any harder’. He also said ‘I am not a Communist, but what we want is a revolution’. Most of the older men said they couldn’t care less about what happened to the coal industry. There was nothing in it for them. ‘Jam tomorrow’ was always being offered, but it never came. My overall impression was that these men, treated so disgracefully all their lives, had little or no faith in any solution other than their own efforts, namely withholding their labour in order to get more pay. When I asked how more pay would solve their problems, in the face of rising prices and other means of controlling their living standards, I met a rather fatalistic response. It was simply ‘we will have to go on fighting for more. If we don’t get more, there won’t be enough miners left to produce the coal’. It was difficult to present the idea that the solution lay in their own hands, that we all had to reject the idea that political parties, trade union leaders or anyone else could do things for us. It is still very difficult for most people to develop confidence in themselves, to rely on their own efforts now, where they live and work. It is also difficult to develop a view of the possible alternatives to this society. What the miners didn’t seem to see was that in practice they were challenging the values of the society we live in, that they were forcing the powers that be to resort to measures which will in the long run expose the nature of this society. When the miners and other working people realise the power they have, real changes will become possible.